The Inverted Scissor cutter by Orleans features two razor sharp blades and a unique design that is perfect for cutting cigars with big ring gauges. It boasts durable construction and eye-catching wood grip. I purchased the Orleans Inverted Scissor cigar cutter from your outfit about four months ago. This cigar cutter is made from high quality surgical stainless steel and makes the right cut each and every time. And what a great value this cutter was for only $9.95 and I got in on an offer for free shipping so that even made the offer better. My suggestion to all cigar smokers is to consider this item and stay away from those flimsy plastic cutters that will eventually crack or break down. 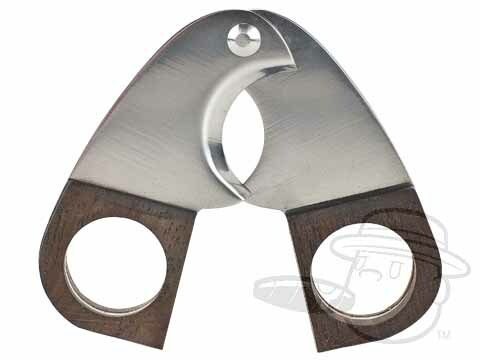 This quality cigar scissor cutter will accommodate all sizes and shapes of cigars. It just goes to show that one does not have to spend a fortune to get a quality product like the Orleans Inverted Scissor cigar cutter. Orleans Inverted Scissor is rated 5 out of 5 based on 2 customer ratings.